Prepare your palette and ready your paintbrushes for Final Touch, a game of forged masterpieces and artistic sabotage for two to four aspiring artists. 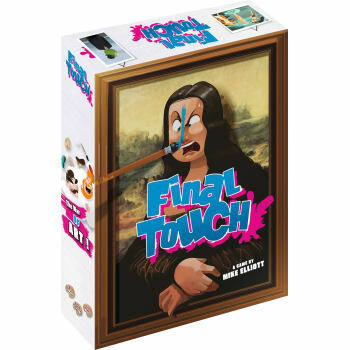 Final Touch is a card-based game in which players race to be the first artist to earn $25 by putting the final touch of paint on a forged painting. Play Touch of Color cards from your hand to either Improve or Smear the forgery, working both together and against your fellow painters. The first player to put the final touch on any forgery in the making will earn the money for that forgery, while Smearing pays it out to your opponents and moves you onto the larger paydays. While you and your opponents may not be the next Picasso, you are all eager to make your mark on the art world, even as clever forgers. Watch your back though, because it's about to get messy!